Posted on Fri 24 Jan 2014 at 10:31 PM PST. Filed under Recipes. I don’t subscribe to dogmas, so the Paleo belief that all legumes are bad for you, doesn’t sit with me anymore. It’s true that legumes are high in lectins, but it’s also true that are very high in nutrients, and also, when soaked for 24 hours and cooked well, they become benign. Certainly more benign than nuts. Just do your own research for the truth of this statement. Personally, I started eating legumes here and there almost 2 years after I went Paleo (by that time, my gut was mostly healed). I haven’t had a single issue associated with them (i.e. indigestion, gas etc). 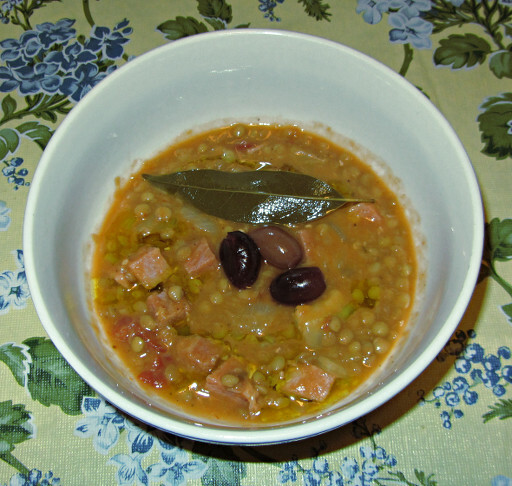 The following recipe is the way my mom prepared lentils as a kid, plus 2 additional ingredients that I found that they bring more to the dish. My husband loved it tonight. 1. If your lentils weren’t bought sprouted (Whole Foods sells some), you must soak them in water for 24 hours. Also, go through them carefully, sometimes there are small stones or barley hiding among the lentils! 2. Bring 4-5 cups of filtered water into boil, in medium heat. Add the lentils in it. 3. Roughly chop the garlic, fennel, and onion, and add them to the boil, along the 2 bay leaves. Cover, and cook until the lentils are done and some of the water has evaporated — about 30-40 minutes (depends how much soup-y you’d like your lentils or not). 4. Chop the ham into half inch cubes (1 cm). Add them to the boil, cook for 3 minutes. 5. Add the tomato puree, and the lemon. Add salt and pepper. Cook for another 3 minutes. 6. Remove from the fire, and serve hot. On each plate, add 2-4 olives, and pour olive oil on top (about a tablespoon for each person). Enjoy!